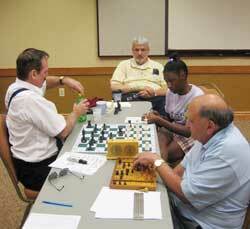 The US Blind Championship is underway in Pittsburgh, PA from October 11-12. This year's event has seven players; the highest rated and the leaders are Michael Allain, of New Jersey, and Daniel Steininger, of Indiana, both rated in the high 1800's. They will face off in the third round this morning. Other players: Albert Pietrolungo, Baltimore; Henry Olynik, White Plains; Virginia Alverson, Massachusetts; David Rosenkoetter, Kansas City, Mo. ; Marc Roda, Harrisburg. The organizer is Rick Varchetto of West Virginia, who also organized some past events, including last year's and the year before. TD is Mike Holsinger of Pittsburgh.